Hundreds of rescued sea turtles left stunned by cold weather in South Texas have headed home to the Gulf of Mexico, but rescuers are on the lookout for more. The Rio Grande Valley Chapter of the Texas Master Naturalists said Wednesday that more "cold-stunned" turtles are expected all along the Texas coast because of another round of cold weather. Curator Jeff George with Sea Turtle Inc. said about 1,200 turtles were found last week on beaches between Corpus Christi and Boca Chica Beach at the south tip of South Padre Island. George said about 250 were already dead. Turtles are cold-blooded animals and rely on their environment to regulate their body temperature. A sudden drop in air and water temperature causes their body temperatures to plunge, sending them into a coma-like state. 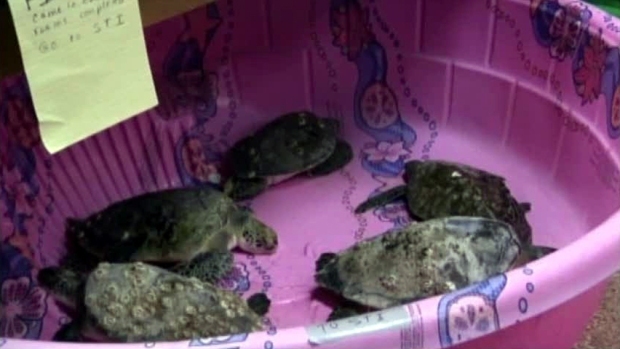 Hundreds of sea turtles were rescued after they were left stunned by cold weather. Many cold-stunned animals die if they are left unattended. "Rescuing cold-stunned sea turtles is tough," Cameron County Coastal and Marine Resource agent Tony Reisinger said in a news release. "It's brutally cold out, and these volunteers have to wait until low tide and then wade out into the cold water and mud to retrieve these animals. Some of these turtles weigh more than 100 pounds, and it can prove exhausting to the volunteers to get the turtles back onto shore and into vehicles." Most of the turtles rescued Friday were released over the weekend when temperatures warmed.